The standard roll up banner is stylish and affordable. It is ideal for travelling to expos and trade-shows. The roll up banner print is on good quality PVC (no side curl) and all banners are supplied with carry bags. 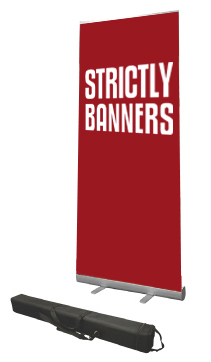 Note: Our standard pull up banners are much better quality than most similar looking banners you may see advertised. Some banner companies sell this banner as their premium product.